Commencing to close gap in Nicol subsidiary dam [Victoria Dock construction, Bombay]. bl.uk > Online Gallery Home	> Online exhibitions	> Asia, Pacific and Africa Collections	> Commencing to close gap in Nicol subsidiary dam [Victoria Dock construction, Bombay]. The need for new docks at Bombay was created in the mid-19th century when the city experienced a growth in economic prosperity due to an increase in trade, particularly in cotton. 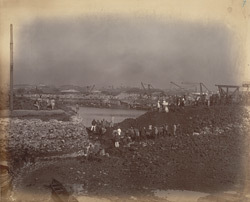 Construction was initiated by the Elphinstone Land and Press Company launched by Nicol and Co. in 1858 and completed by the Bombay Port Trust in the last decade of the century. All of the building took place on land reclaimed from the sea.